KingDice offers a new style of dice game to the Bitcoin casino market; one which works in a similar way to most other Bitcoin dice games. This game is designed to bet Bitcoin to make even more Bitcoin with just a roll of the dice. KingDice.com’s interface is neatly set out to accommodate even the newest of dice lovers. On the betting page, users can have access to their bets, all bets, high rollers, and to the leaderboards via conveniently laid out tabs. There are also quick commands available to make betting easier, such as betting ½ (one half) of the current threshold, x2, or even all funds, at the click of a button. When rolling the dice, a set of “real” dice fall from the sky, providing an authentic feel to this popular dice game. Users also have the ability to turn this function of if they’d prefer faster and less fussy action. The game is simple. Users simply need to deposit BTC (a list of cryptocurrencies is available later in this review) followed by placing a bet amount on the outcome of a roll which ranges anywhere between 1 and 100. The lower your chances of winning, the higher your Bitcoin payout will be! Playing on KingDice is quite intuitive and just about anyone should be able to figure things out fairly quickly. There is one game on offer at KingDice.com. Dice enthusiasts get to roll two dice at the same time. 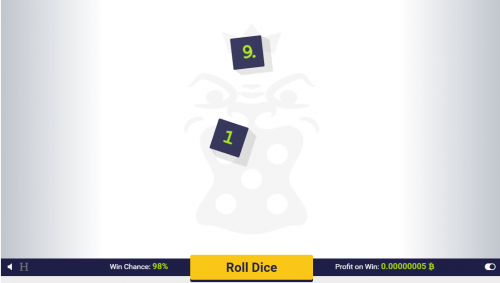 Before rolling the dice, a user must select their “roll under” amount. The aim of the game is to choose a “roll under” value that you believe you are going to roll under in order to win. Is it strategic or is it chance? We highly recommend you give this game a few rolls to get your intuition in! The house edge is quite low at only 1%. Therefore gamblers will be able to reap high reward when winning. Those of you who want to be in control of each bet and change the numbers accordingly will prefer the manual betting option. KingDice.com has no specific promotions on offer, but there are a few features which make this site well worth visiting. Firstly if you are a bit uneasy about spending your own Bitcoin immediately, KingDice.com rewards players 500 free Satoshi every minute when their balance is low enough. Of course, those who exploit this faucet system will be blocked without hesitation. There is also a monthly wager contest, offering prizes of around 1 Bitcoin. This feature comes with its own rules and regulations. There is also an investment opportunity. KingDice.com offers an investment option, providing a percentage of the total profit being made by users. We always caution gamblers to read the rules and regulations of all promotions and features to ensure safe and fair gaming experiences for everyone. In order to play with KingDice.com, the first thing that needs to happen is for gamblers to follow an easy registration process. This registration requires only a username and password. You can deposit Bitcoins whenever you wish and bet a minimum of 100 Satoshi on each dice roll. Withdrawals are processed almost immediately making this an attractive feature for gamblers to KingDice.com. KingDice.com is a purely Bitcoin only site. KingDice offers an industry-standard provably fair algorithm. This means that before gamblers roll the dice, the platform will show some information on the upcoming roll. This data can then be used to verify whether the outcome of the roll has been tampered with by the server or a third party. This provably fair algorithm is based on the server hash and seed, along with the client seed and server roll. KingDice.com immediately offers open communication between players and the Kingdice.com team. Gamblers are welcome to contact the team via the customer support e-mail address. They are also welcome to visit the FAQ section, at the bottom of the interface for any further queries they may have. 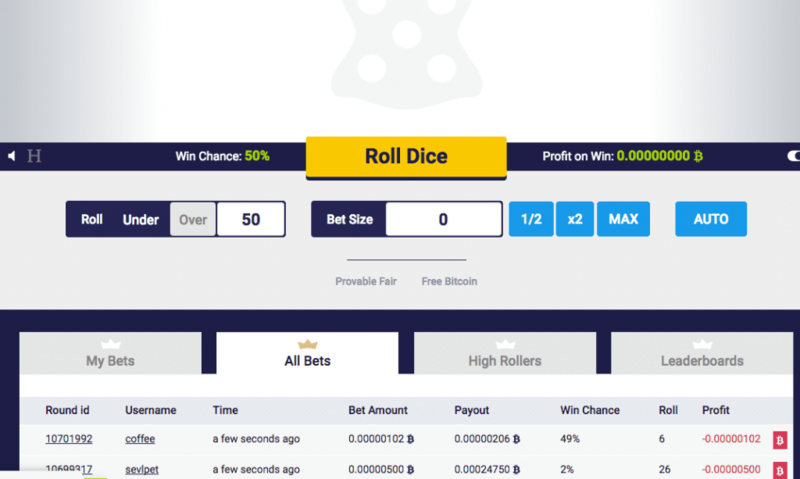 Based on everything that has been outlined so far, KingDice represents a great dice game for Bitcoin lovers throughout the world, which offers all of the perks of other dice sites while also being suited up with a better design and user interface. Additionally, the website is fully optimized for iOS and Android devices, allowing you to fulfil your dice urge at any time in any place. Kingdice.com comes highly recommended for novice and experienced players alike, whether you have a Satoshi or two to offer or you are a high roller looking for big Bitcoin action.